Since the start of the year I've been writing a book. 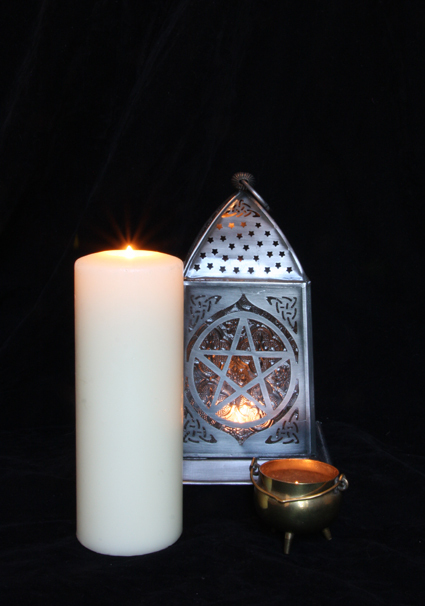 It is called Candle Magic: A Witch’s Guide to Candle Spells and Rituals and is going to be published in the Moon Books Pagan Portals series, aimed at beginners to the Craft. My book is very nearly finished and I am really excited about it - but I need your help. I'm in the process of deciding what picture should go on the front cover and being a keen photographer I decided to try taking some pictures myself rather than use one from a stock of images. Obviously the cover has to show at least one candle, but I wasn't sure what else to include so I started by taking a lot of different pictures. Some included things like spell books and a crystal ball, while others just had candles. Although I really liked the ones that had a pile of witchy paraphernalia, I decided to stick just to candles as that is the subject of the book and I took the four photos you can see on this post. 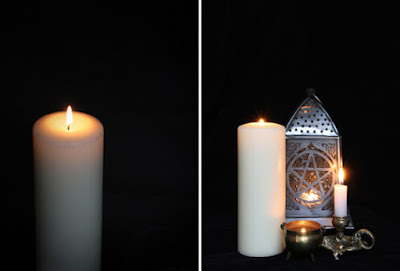 However, I still can't decide whether to go for a single candle or several and I would love to hear people's opinions about which works best. Please leave a comment telling me which of the four pictures you prefer. Number 3 for me please. 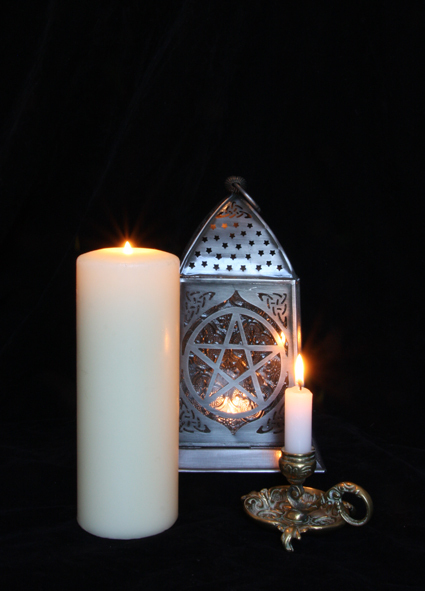 the pentagram lantern and cauldron are great witchy touches. I would have said the fork 'andles, but I think you are right, it's a bit busy. Number 4 is my personal choice. All are good, though. I'd have said number 3, but the tea-light in the cauldron in 2 and 3 isn't obvious enough. I'm going with the majority - number 4, for all the reasons the others have said. I'd liked number 2 best of the others. Thanks for all the comments, please keep them coming :) At the moment four seems to be slightly ahead in the race. Yes, I agree the lantern is beautiful! Thanks very much to Bekie for lending it to me. Either #1 or #4 for me. #1 for the simplicity of the image, but #4 is more visually interesting and gives more of the sense of there being more than one aspect to the subject. I go for #4. I'm a big fan of candle magic (and all magic), and feel this one speaks to me more. I like no 2 best now. The lighting is cosy and showing 4 options of candles makes me excited about the variety of info I will find in the book. I think stylistically the light the colors in no 2 work best and balance and enhance each other. #2 is too busy. I like 3 and 4. Definitely number 2 for me. The four different candles suggest a variety of contents and of course for a Two Ronnie's lover, the in-joke is too good to miss! Number 4 for me. It balances better than the others. #4 for me. It's a lovely composition.